Song: Judy Coates - “God Bless America”. President welcomed everyone to the meeting. He acknowledged the presence of our guest speaker and other guests present. President acknowledged the presence of our guests and guest speaker and he thanked them for taking the time to be with us today. He welcomed Andy Duchan back especially after a major surgery and told him we were happy that he’s back and is doing well after his surgery. Dave Friedman spoke briefly about his plans for our club under his leadership. He expressed his desires to continue our annual Track Meet Event. He announced that the 2017 Track Meet will be a spectacular event and urge everyone to commit to the event. Wynne Ritch acknowledged the presence of Ty Trumbo, from “The Republic Services” organization. The organization is one of our major sponsors for our Annual Track Meet. They are usually one of the first organizations our club reaches out to for help and support. In response, Ty Trumbo said he loves the great work our club does within and around the community, and promised that his organization will do more to help and support our work in the future. Dave Friedman reminded members to please purchase tickets for the forthcoming District Dinner coming up next month. Interested members should please see Les Grossman. Richard Miller urge members to use the “Invite” cards to invite guest and family to our regular meeting/events. Ms. Haley Zafrani was inducted during the meeting. Richard Miller ADG was on hand to induct our newest member. As always, we were happy to have her join our club. 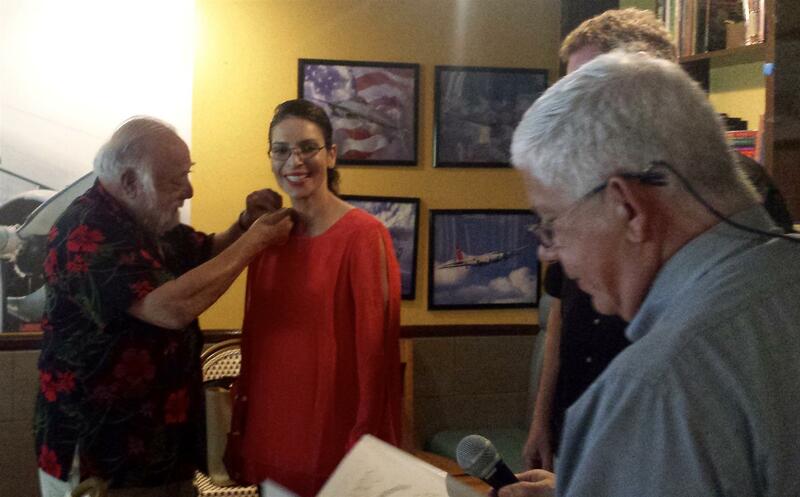 Newly inducted Rotarian Haley Zafrani addressing the club while club President Dave Friedman, James Tenner her sponsor , and Richard Miller ADG looks on. Marc Tapper was asked to formally introduce our guest speaker to the podium. Mr. Bob Donovan is an Executive at Operation Gratitude, a 501c nonprofit organization, based in the city of Van Nuys. Operation Gratitude was founded by Carolyn Blanchet. Carolyn believed that “no one fighting for her country should go without a care package”. Operation Gratitude prepares packages containing little things like chocolates, cookies and other essentials that is not commonly found overseas and which our service personnel might not have access to while overseas. The organization has been preparing such care packages for many years from donations and personal funds. Three years ago, the organization hit three million care packages that were sent out. These care packages are sent out to Veteran, first responders, wounded kids in boot-camps and men and women severing overseas. Today, the organization has the ability to put out about 10,000 packages a day. The organization does this great work with the help of an amble number of hardworking and dedicated volunteers. Operation Gratitude also have a program called “Battalion Buddies”. These are little stuffed bears and they are given to service personnel going overseas. They are suppose to hold the “Battalion Buddies” dear to heart to remember mom and dad or their loved ones at home. 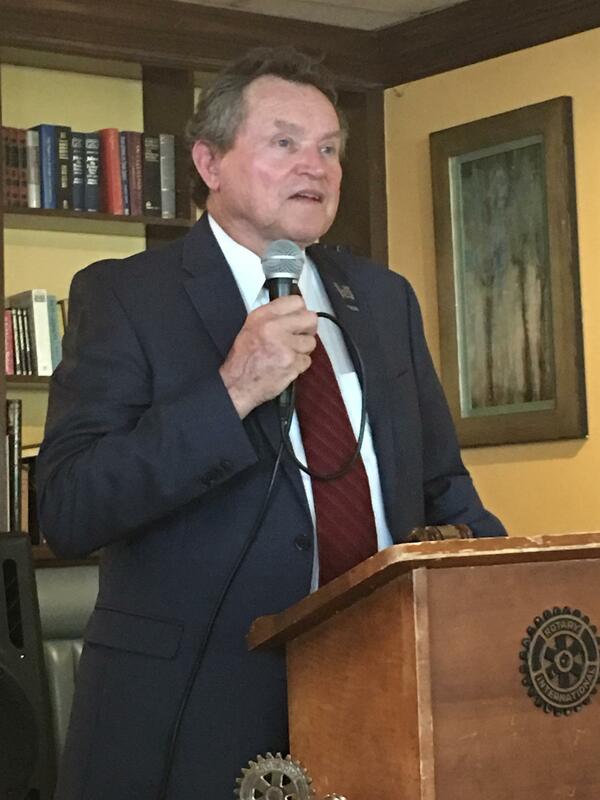 He said that these are some of the things his organization does and he is very happy to be with us today and it is an honor for him to be with us to learn more about the great work rotary does around the world. After a short Q & A session, Dave Friedman thanked Mr. Donovan and on behalf of our club, offered our willingness to volunteer whenever the need arises.